"This delicious recipe is prepared by using adobo seasoned grilled boneless chicken thighs, layering tortillas with a combination of the chicken, cheese, and onion, and heating directly on the grill. Serve with salsa and sour cream." Place the chicken on a plate, and sprinkle with adobo seasoning on both sides. Let it marinate for 15 minutes. Lightly oil the grill grate. Place chicken on grill, and cook for 10 minutes per side, or until juices run clear. Remove chicken from grill, and cut into bite-size pieces. 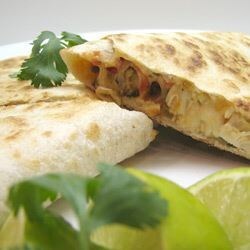 Place one or two tortillas on the grill, and sprinkle with a thin layer of cheese, chicken, onion, olives, and chiles. Top with another tortilla, and grill until brown and crispy on both sides, about 3 minutes per side. Repeat with remaining ingredients. Cut into wedges to serve. My husband loved these. We cooked them on our George Foreman grill in no time. You can't ask for a quicker, easier meal! make sure to wet the flour totilla's a little, they'll steam on the grill and won't burn as easy!!! enjoy. Fun and easy!!!!! Great for kids! this is a quick recipe except for getting the grill ready. really fast if you own a gas grill. Makes a lot of servings. Could upgrade to using chicken breasts and guacamole. I loved grilling quesadillas on the grill. I used boneless chicken breast. My kids don't enjoy spicy foods that much, so next time I will use just plain chicken on theirs.